Ken Robinson speaks of teachers as gardeners. A gardener does not make plants, he provides the best conditions for seeds to flourish and bloom. In a similar manner, a teacher cannot control the destiny of a child, but he can provide the best conditions for a child to chart his/her path to success. These best conditions are a two way process – one in which the teacher as much as the learner contributes to creating a nurturing and learning environment. Andrew Miller, in an educational blog on how teachers need to innovate their teaching methodology, writes, “Personally, this was and is my favourite part about teaching – the opportunity to design and be creative, to design learning that meets the needs of my students, to try new things – and perhaps the opportunity to fail.” (Miller, 2014) As a language teacher, I have confronted many situations that have invariably provided me with opportunities to not just try things, but to fail as well. In this regard, it is my learners who can bear testimony to this fact, more than anyone else involved in the teaching-learning process. Once towards the end of an academic year, a class 6 student presented me with a greeting card. It said: Thank you, ma’am, for making the English period fun. Your efforts of joining study and fun were successful, but sometimes they failed. I wish you to be our English teacher in 7th also. Needless to say, I was overwhelmed. But, what I found more striking was the honesty and truthfulness with which this learner had acknowledged my occasional failure at trying innovative methods of teaching. It is then that I realized that student feedback, if used constructively, could be an invaluable resource for teachers to tap into to improve their pedagogic approaches in classrooms. I found my learner’s remark extremely invaluable; student feedback can become an integral part of reflective pedagogy. Student feedback, together with reflective pedagogy, equips teachers to build on insights provided by their learners, making the class truly democratic and constructive. What is of importance here is the fact that the student noticed that I did not use the textbook in class, and this she considered to be a positive point. In order to create magical learning moments for children, teachers need to correspond their strategies with changes in age group, learning style, and socio-cultural environment of their students. Encouraged by these frank expressions from my learners, I decided to give them a feedback questionnaire. I wanted to know what my learners thought of my teaching practices and what their own magical moments in class were. I designed a feedback questionnaire for them to rate the classroom ethos that we practiced in class, such as the practice of raising one’s hand prior to asking questions; pace and language of the class; extent of activities conducted; and home tasks given. In addition, they were asked to write about such questions as: Which topic did you find the most interesting in English class? When did you find the class most boring and why? My learners seemed excited and surprised at having been given a chance to rate their teacher, instead of the other way round, which is usually the norm. As a matter of fact, I could even see them discuss certain questions with friends! The activity was very useful for me as a teacher, for learners poured in all sorts of remarks they could come up with in relation to classroom teaching. Initially, some of them were a little hesitant. They were doing this for the first time and they were not sure how their remarks would go down with me. But having established an honest and frank environment right from the beginning, I did not have to make too many efforts to convince them why this was being done. After handing in their questionnaires, some learners even suggested that this should happen more often than just toward the end of the session. It was then that I realized that student feedback need not be restricted to a questionnaire format. Classroom situations provide ample opportunities (both, informal and formal) for a teacher to give leaners an agency to reflect on and analyze subject specific methodologies, so as to identify the effective methods, not-so-effective methods, topics of interest, and so on. Student feedback creates open and flexible ethos that are also central to reflective teaching. • Observations and evaluations of lessons transacted. • Defining teaching goals and beliefs. • Assessing teaching methods and strategies. • Issues of classroom management. • Factors leading to personal and professional growth. However, such an exercise requires sustained efforts on the part of the teachers, if it is to enrich their professional knowledge. Establishing a classroom ambience in which learners can articulate, without any inhibition, their views about how certain topics can be studied; and relevant activities that could be conducted around a particular topic, requires consistent efforts, more than the ways of incorporating student feedback in the classroom. As a matter of fact, teachers can utilize plenty of online resources available on student feedback, but such resources can prove successful only when they are commensurate with the learners’ context, along with careful planning by teachers, prior to executing them in class. It is only then that a class can become truly constructive in essence. Feedback from students gave me an opportunity to ponder on my usual classroom strategies. Even though, initially it was a struggle to put into place such an unconventional practice, it was indeed worth all the efforts. With time and consistent efforts, I was able to make it an integral part of my classroom preparation. Not only did I become more enthusiastic about my own profession, it made me conscious of one crucial aspect of classroom pedagogy – more than anyone involved in the educational process, it is the learners towards whom a teacher is most accountable. If teachers become forthcoming in inviting and acknowledging students’ reflections, they can raise the standard of their class to a whole new level. Learning from and using student feedback as a pedagogic resource can be one of the most fulfilling and humbling professional experiences for a teacher. Braithwaite, E.R. (1990). To Sir, with Love. USA:Penguin. Dewey, J. (1933). How we think. New York, NY: Prometheus Books. (Original work published 1910). Krishna, K. (2013). Learning from Feedback. Journal of the Krishnamurti Schools, (17), 105-110. Retrieved from http://www.journal.kfionline.org/issue-17. Miller, A. (2014, February 20). The Teachers are Learning Designers. Retrieved from http://www.edutopia.org/blog/teachers-are-learning-designers-andrew-miller. Robnison, K. (2008, March 25). Developing Imagination in Education . Retrieved from http://www.youtube.com/watch?v=aT_121H3kLY. Sawhney, S. (2014).Reflective Journal Writing. Language and Language Teaching, 3 (6), 22-26. Retrieved from http://azimpremjiuniversity.edu.in/SitePages/pdf/LLT_6_PDF_Final_July_2014.pdf. I had a special learner in my sixth grade, with attention deficit hyperactivity disorder. Very often, it used to be very difficult to sustain his attention in the classroom. After running short of ways, I decided to seek assistance from my learners. I asked them to suggest ways in which I could involve this child in the learning process. Among several of them, the most characteristic was the one that I decided to employ while studying the poem ‘Cat’s Envy’. Some of my learners had suggested that we enact self-composed poems in groups, the theme of which was animals, since the poem was based on a child’s envy of her pet cat. The activity was an instant hit among the learners. They composed a poem on the tiger and made this child enact the role of the tiger in the poem! The child not only growled and roared to his heart’s content, but he also exhibited readiness to adjust and work in coordination with other group members. The author is a teacher by profession. 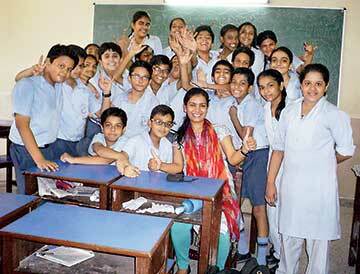 She is currently pursuing her M.Ed at the Central Institute of Education, Department of Education, Delhi University. She can be reached at disha.nanu@gmail.com.